This page will share step-by-step guide to increase size of C drive when RAID 5 has not enough free space on it in Windows 2003. Download IM-Magic Partition Resizer Server to extend C drive space on RAID 5 under Windows Server 2003. 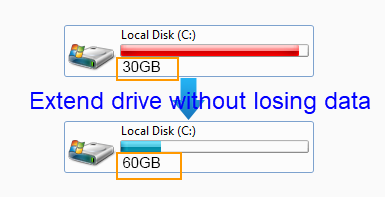 How to increase the sizes of C drive when it is running on low disk space on RAID 5 in Windows Server 2003? Do you need to rebuild array in order to resize C drive on RAID 5? If you are still wondering if it is possible to fix low disk space on C drive without deleting data or rebuilding array, you can use IM-Magic Partition Resizer Server. This is a professional partition tool, which allows you to resize disk space without deleting any data. You can extend C drive on RAID 5 in Windows Server 2003 without rebuilding array or reinstalling system. You can follow the steps below to resize RAID 5 C drive on Windows 2003. You can move the arrows to increase the size of C drive and then click "Apply" button. "I have 3 SATA hard drives on RAID 5 array in Windows Server 2003, but the problem is that C drive on this array is running out of disk space. I am wondering if it is possible to increase the size of C drive without rebuilding array. I don't know how to rebuild array, so I want to look for an easy way to extend C drive space on Windows 2003. Can anybody give me some advice?" >> How to fix low disk space on Windows 2003 c drive without reinstalling system? >> Can I increase size of C drive without rebooting computer? >> Is it possible to extend C drive without losing any data? >> How do I expand system partition without formatting disk? For problems above, you can fix low disk space on C drive by using partition software. The partition software has the ability to resize disk partition on RAID 5 or basic hard disk on Windows Server 2003 and other Windows Servers. With help of this partition software, you can move free space from other partition on the array to the C drive so as to get it expanded. What if there is no free space on other partition on the array? Don’t panic! You can add new disk to the array when there is no free space on the RAID 5. When adding new disk, you should check if the array can be compatible with the new added disk. Usually, the new added disk will show as unallocated space. Then, you can run the software to add the unallocated space to C drive. You may add new disk and rebuild RAID 5 array when C drive is running out of disk space. If so, you need to backup data and formatting the disk. You had better not rebuild array unless you are sure you can do it well. 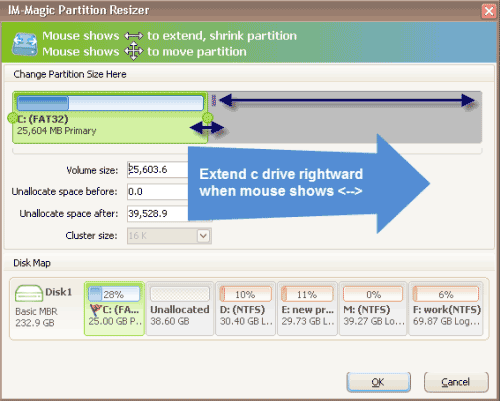 If you can use IM-Magic Partition Resizer Server, things will become much easier. This partition software provides an easy solution for C drive space increasing without rebuilding array. You have no need to waste time to backup data or format disk to rebuild array. In contrast, you just need to move free space from another partition to C drive. When C drive is running out of disk space, the most common solution that most people would come up with is to delete or move some files to free up disk space. However, deleting or moving data cannot resolve the problem thoroughly. The space will be eaten up soon when new data is stored in the drive. If you use the partition software, you can extend the C drive space without deleting or moving any data. You can expand C drive efficiently by using this partition software, which is time-saving. You do not need to waste time to reinstall system or reboot your computer.